Deutscher Name: Whoa There Nelly! Englischer Name: Whoa There Nelly! Play when one of your Friends has been dismissed. Put it into your hand. 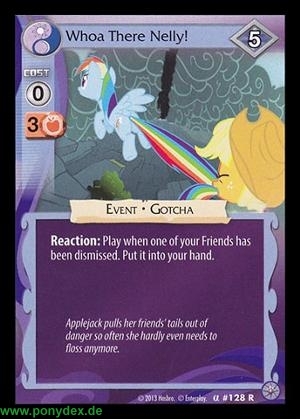 Applejack pulls her friends' tails out of danger so often she hardly needs to floss anymore.